Any quantity only $1.89 per oz over spot! Over 50 years of producing gold and silver bars for investors around the globe, Valcambi Suisse has established a track record of excellence. Today, the refinery at Valcambi produces minted ingot and cast bars using both gold and silver; its brand is recognized around the globe as one of the finest in precious metals. Silver.com now offers the 1 Kilo Silver Valcambi Cast Bar in new condition. 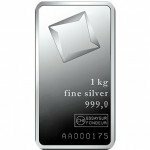 Consists of 1 Kilogram, 32.15 ounces, of .999 fine silver. Features a rough, rustic finish. Engravings stamped into the surface. Ships in new condition with assay card to authenticate product. Individual bars arrive in sealed plastic courtesy of Valcambi. 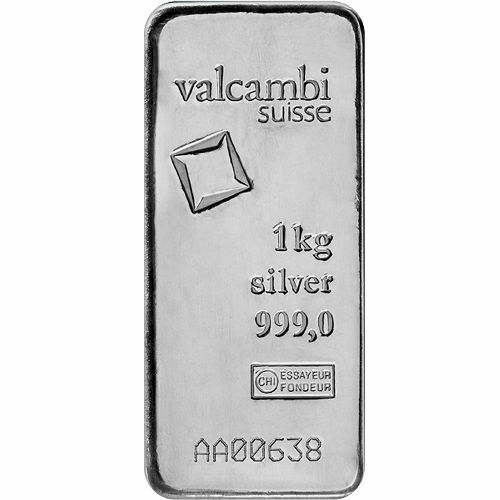 Valcambi Suisse produces its silver bars using either a minted ingot process or a cast production process. These 1 Kilo Silver Valcambi Bars are produced using the cast process. Requiring less fabrication, cast bars are created by pouring molten precious metals into casts. Once the cast is full, the newly formed bar is dropped into water to cool or left to cool in the open air. As a result of the lower fabrication costs, cast bars have lower premium costs, making them a great investment choice for those looking to start a new portfolio or make large acquisitions of silver. Each of these bars features a rustic finish, and ships to you in new condition with an assay card. The assay card includes an assayer’s signature, verifying the weight and purity of the bar, and has a matching serial number for each individual bar. On the obverse face of these 1 Kilo Silver Valcambi Cast Bars are numerous engravings identifying the refinery and the bar. “Valcambi Suisse” is engraved at the top of the bar, with the company’s rotating square logo below that. The next set of engravings includes the weight, metal content, and purity of the bar. At the bottom is the assayer’s mark and the individual serial number, which can be compared to the assay card to verify the bar’s authenticity. Valcambi Suisse was originally founded in 1961 as Valori & Cambi. Following the refinery’s acquisition by Credit Suisse in 1968, the combined Valcambi refinery became Valcambi Suisse. If you have any questions about these cast silver bars, don’t hesitate to reach out to a Silver.com associate. You can reach us on the phone at 888-989-7223, connect with us online using our live web chat, or via email. 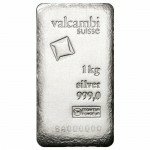 If you are looking for similar products, be sure to check out our full selection of Valcambi Silver Bars.